Lamanai! This is our Number 1 rated tour. When traveling with our Book of Mormon Cruise group, our journey to Lamanai starts before we even leave the cruise ship. Our ship anchors several miles from shore and we take ‘tender’ boats to shore. Once ashore at Belize City, Belize we will start our amazing adventure to the ruins of Lamanai. Our air conditioned bus will take us through the city and country to give us a picturesque tour of Belize. Our bus will take us to the shore of the New River. If you ever wanted to be Indiana Jones, now is your chance. To reach the ruins of Lamanai, you must travel on a spectacular boat ride up the New River through the jungles of Belize. You’ll be sure to spot tropical birds, monkeys, and perhaps a crocodile before arriving at this ancient city. Check out the video of the river and the boat ride that whisks us back in time to the hidden city of Lamanai! Many people have commented that the boat ride alone was worth the time and expense of the trip…but it is only the begining! At Lamanai, we have the chance to climb three different temples. 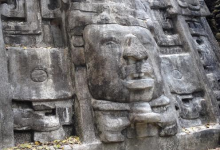 We can climb the Jaguar Temple (which has a lot of LDS themed significance), and the Lag Temple where you will be able to climb 125 feet to the top and gain an unforgettable view of the whole Lamanai ruins, New River Lagoon, and the vast Lamanai Archeology Reserve. We can also climb the Temple of the Mask. The small onsite museum where our Lamanai exploration ends is home to artifacts spanning well over 2,000 years of Mayan History. We will also relax and enjoy an amazing Belizean lunch which is included, before our return trip down the New River! These ruins date back well over 2000 years and clearly carry a unique Book of Mormon name. Prior to our day at Lamanai, we will discuss the Book of Mormon similarities found at Lamanai, the history of the city, as well as the location and how it all relates to things mentioned in the Book of Mormon! Some scholars have claimed Lamanai as a potential location for the Book of Mormon city of Jershon. Either way, our visit to Lamanai is one you will never forget!